About one month ago, g3gg0 found a way to access the LCD display from bootloader context, without calling anything from the main firmware. This makes a very powerful tool for diagnosing bricked cameras, and also a playground for low-level reverse engineering. - we have to call a Canon routine that initializes the display (which is in bootloader, not in main firmware): we named it "fromutil_disp_init". - for the YUV layer, newer cameras use YUV422, while older cameras (only checked 5D2) use YUV411. This difference is not essential (you can print on the BMP layer only). Today I wrote an autodetection routine that finds the display init routine from ROM strings, and the result is a portable "hello world" binary. That means, it should print something on any ML-enabled camera (and maybe even on cameras without ML). Same binary for all cameras, of course. I've tested the code on 5D3 and 60D, and I'm looking for confirmation on the other models. If you are already running ML, just download this autoexec.bin, run it, take a picture of your camera screen (sorry, no screenshots yet) and upload it here. 650D: Inserted card, closed door and this showed up without turning power switch to ON. 7D: Not working. Black screen. with 550D I was also able to autodetect and call FIO_CreateFile, FIO_Write and FIO_Close to dump the memory, but it did not work on all models. @Walter: can you download it again and retry the test? @Indy: yeah, file writing from bootloader behaves the same here (works on some cameras, but not all); g3gg0 also tried direct SD access, which works on 5D3 and 600D only for now. 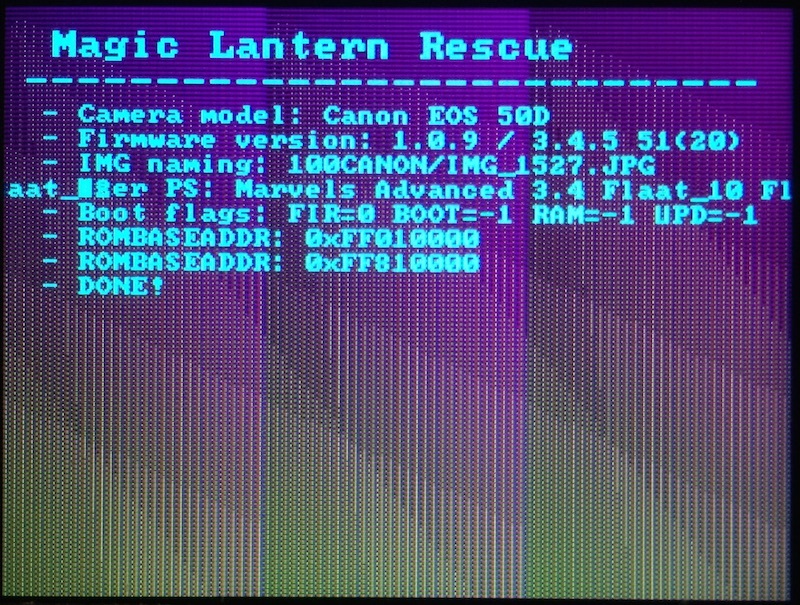 No more running code on top of Canons firmware! Put card in cardreader. Backup ML directory. Delete ML directory and Autoexec.bin from card. Copy extracted nightly content to card. (In fact: The only thing you really need to do is to replace Autoexec.bin with the one used before). NOTE: it is possible to execute with the card door open. (not sure how to post the picture from dropbox, but here is the link. Cool that it works without turning the camera on! Edit: It worked for me yesterday. I moved it to my page. Thanks for the effort Pelican. Sill not working do, should not matter as the link works! I compiled the autoexec.bin myself from the recovery branch using the portable platform. Interestingly when one compares the output for my EOS-M with the one from jpaana - the second IMG-naming property looks correctly resolved on mine but not on his? I have the feeling something with the property parsing is not going correctly. Can you also check if the DUAL prefix option from Dual ISO works on EOS-M? I guess it doesn't.